Well, what a weekend it has been! Especially for the Sven fans. Saturday was a new treat for me and just a couple of stops on the train to Hasselt. The guys were off doing other stuff so I was off on my own for the day. After the Paris attacks last week Belgium has been on alert and there was advice about not taking bags, but with my weather app playing up as well, I just decided to go for the usual and wing it if necessary. I had to ask a local for directions when I got to Hasselt and was glad he got me on the right bus ‘cos otherwise I may have been wandering around for hours (no sense of direction and what exactly is Google maps good for?). Actually, I was rather chuffed that my bad Dutch went undetected at first, although I am SO found out when people reply in local dialects and superfast. I had done a bit of studying beforehand (stranger things have happened!) so I knew a little bit of the course and where I wanted to see. Folks who like course pR0n would love this place, even the slag-heap hill where they are apparently building a new swimming pool was incorporated into the course. 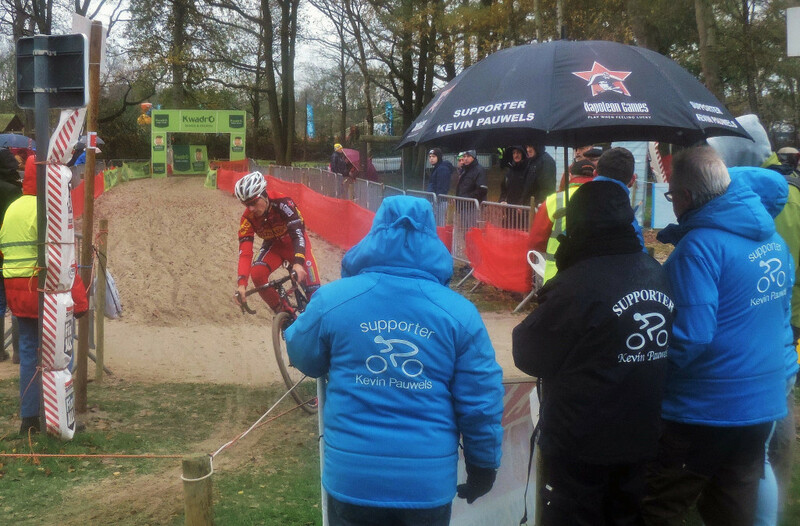 I love the Soudal Classic races where I am just about the only non-Belgian spectator and the sandpit is, in fact, the kiddies playground. It turns out I get places really early when I go on my own. Even the coffee wasn’t ready, but Helen Wyman was already out practising. Now, I love the Newbies race cos you get all sorts, all ages and guys and girls together. However, as the older guys generally win, the young girls are never really recognised. There is not a separate podium or anything (as the idea of developing womens cycling has instigated the U23 category maybe we could see the young ones recognised too) so I am not actually sure who was the first girl to finish. I think I heard them say Tess van Loy, but then again…Someone who reads this may know. So today instead of saying yay Niels Vandeputte, Arno van den Broek and Len Dejonghe, I’m going to sing the praises of Magdalena Misonova. This young Czech girl may be all arms and legs with boundless energy and an enthusiasm reserved for the very young; she may well have been dead last from the start, but she gave it a fair go and, despite the race caller saying over the speaker that it was all over and she didn’t need to continue, she bloody well did (determined or just doesn’t speak the language?) and finished the full race. Chapeau Miss Magdalena. Please, please carry on and one day you will be a star. 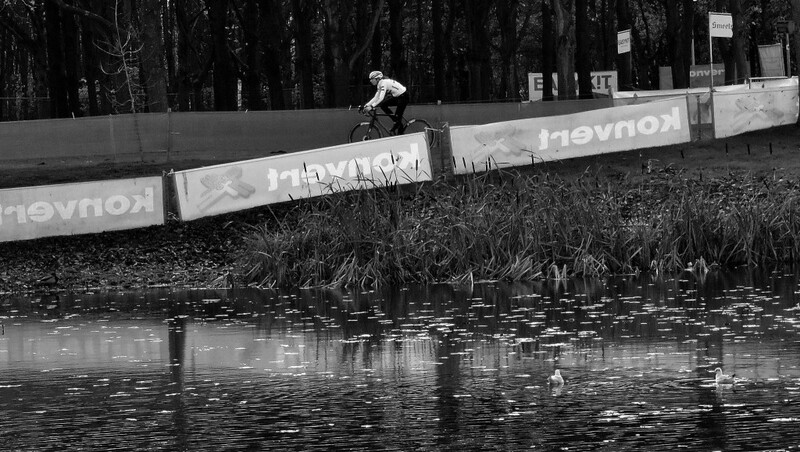 I have to admit that I wasn’t gripped by the Juniors Race, but I did get the chance to have more of a look at the course and the really tricksy bit of down, through the ruts, up then round by the skateboard park, up steep step, down, sharp right and steep up. The young guys were riding most of this, but the sun was still out and the course dry enough to manage, except the last steep up, which coming so soon after the turn, there is no momentum for. 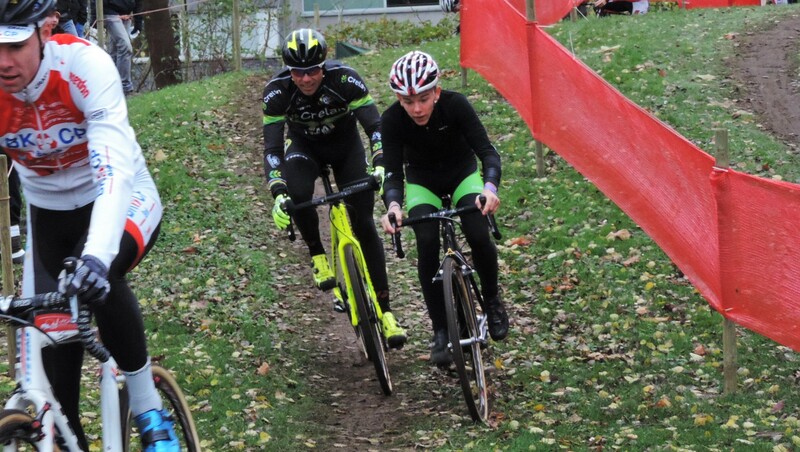 I will admit that I think CXHairs has got me obsessing about ruts and this one took my eye. 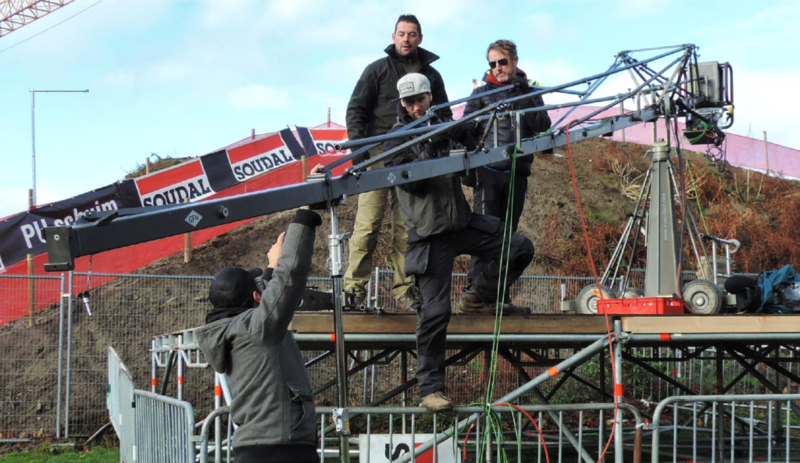 Congratulations to Arne Vrachten, Timo Kielich and Mathijs Wuyts for the podium. This being a smaller event there are only 4 races on the card and the U23 men will ride with the Elite Men instead of having a race of their own. So the next race was the women’s race, but there was an hour or more to wait for that. Luckily I ran in to a bunch of Kevin Pauwels supporters (we are a dedicated bunch of idiots) for a chat and to watch the men have a practice. Then the temperature dropped and the rain came. Then the rain turned to sleet. Extra clothing was put on and I probably looked ridiculous in my cap plus bobble hat, but who cares? As the women’s race was, once again, televised live on Sporza I won’t go in to details, but it was a 4-way race from the off with Maud Kaptheijns taking her turn to chase Sanne Cant. Maud is having a pretty good season so far and, at the age of just 21, could have a fantastic career ahead of her. 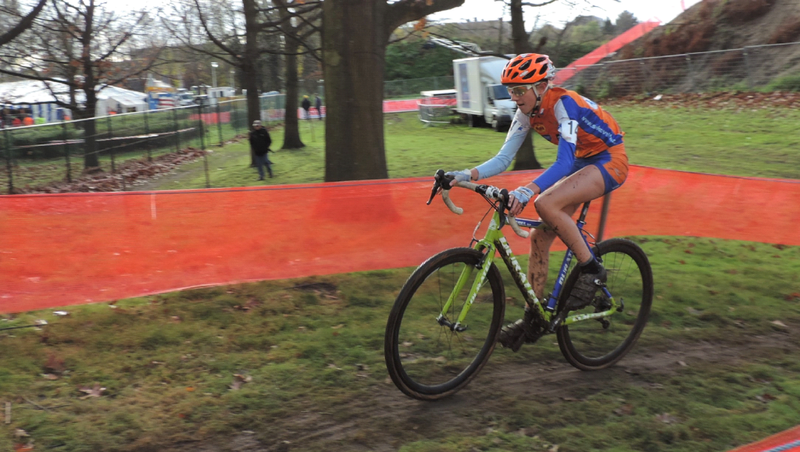 Although there ended up being a bit of a sprint for 3rd place Ellen van Loy was good for it with Helen Wyman missing out on the podium again. I’m sure she will get there again soon though. 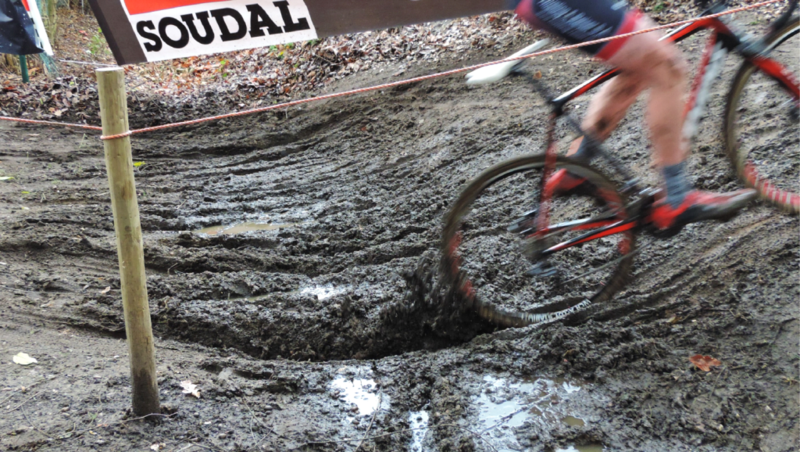 With all the rain the course was turning nasty and slippery and that dip with the muddy ruts was now just a big puddle. The men were gong to be tested just a bit more, but at least the temperature had increased to a balmy 1C. The beer tent was totally packed but was the only warm spot on the course. I didn’t get anywhere near the bar, but managed to thaw out a bit. We saw the pre-start interviews on the big screen, but there was no sound. As the rain paused for a few minutes I headed back out to the planks for the first couple of laps, My bad Dutch actually allows me to speak to people a bit now and I met a group of people enjoying their Saturday afternoon with a bottle of Cactus Juice which was nowhere near half-full! Of course, they were Sven fans, but allowed that I could shout for Kevin. On the first pass through though I also cheered for Klass which, even though he is Belgian Champion, is a massive faux-pas that noone has yet been able to give me a good reason for. This race turned in to a 3-way lead with Sven and Kevin being joined by Tom Meeusen each taking their turn on the front. Diether Sweeck was the solo chaser and is starting to show some excellent form. having started at the furthest part of the course I gradually made my way to to finish line via the pits and a quick GPON! 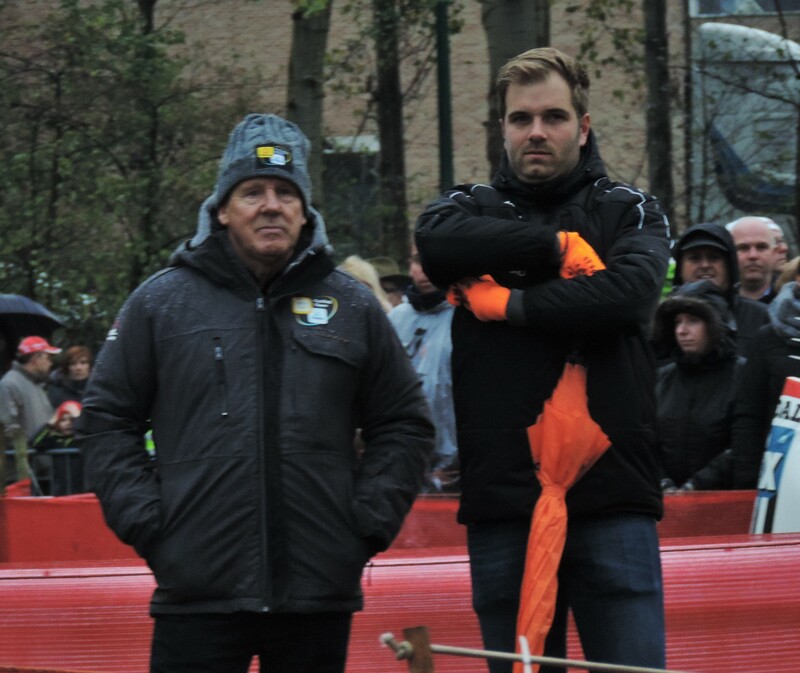 Kevin was undone at the slagheap every lap when Sven and Tom managed to ride to the very top and this proved decisive with him losing touch on the last part of the last lap and the Sven winning the sprint. The crowd went mad! Sven’s first win of the season and for quite some time. What a shame that so many people were put off coming to see it because of the violence elsewhere. 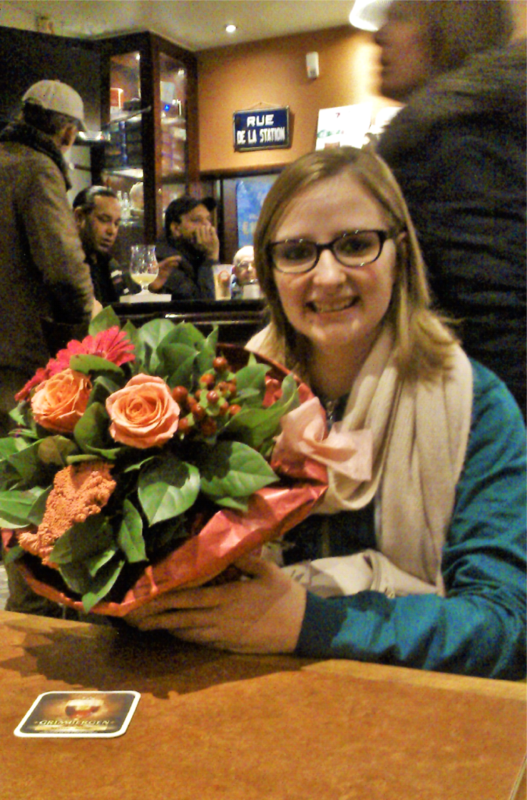 At the end of the podium ceremony Sven threw his flowers into the crowd and this is Emmelina (hope I spelled that right) who caught them, warming up in the Hasselt Station Buffet waiting for a train home. 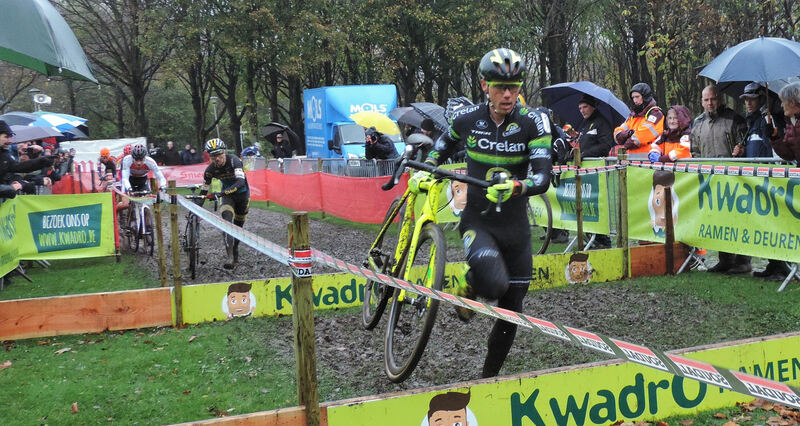 A really fun day was had, but I promised I would dig out my thermal gloves before heading to Koksijde. 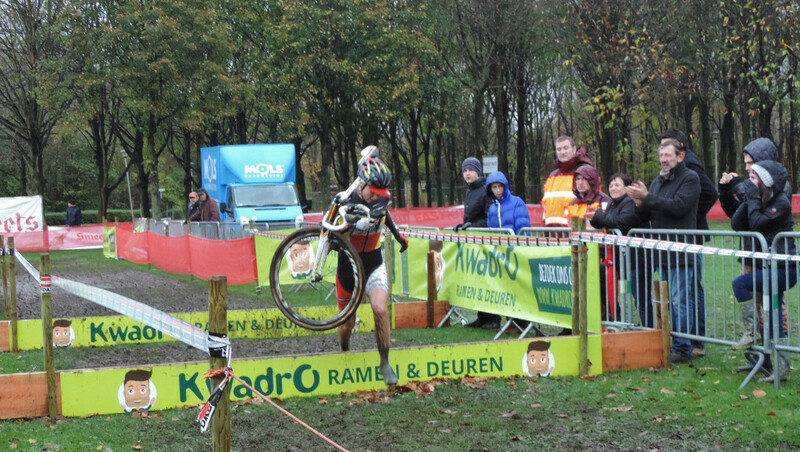 Love these AFIs from Cat Armour… gives a great perspective of what it is like to see these Belgium races! Hmmmm. Niels going the way of Bart, few less pies in order. 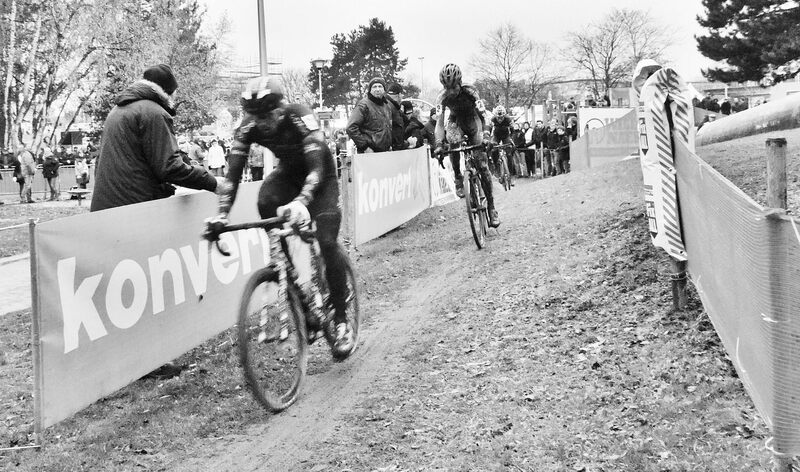 In prior years we have been in Koksijde but with move to Sunday (does anyone know why this happened?) we went to Hasselt. Very glad we did, was an excellent lower key event and great racing as well, even if slightly overshadowed by the next day’s events in the dunes. Still, we were there when Sven broke his c.12 month drought. As a Kevin fan am getting tired of his there or thereabouts season, would like a slightly longer than 2 races run of victories. The organisers were clearly a bit wrong footed by the heightened security requirements and I kind of felt for them but the absence of secure bag storage was a bit tedious if you had traveled by train, brought food, some reading material and enough clothes to endure the temps and the sleet. Interested you managed to sweet talk your way in with a bag – race organisation, teams and women allowed, apparently. We were offered a spot by the vending machine near the Friture at the entrance to deposit our bags in the hope they would still be there at the end. Bags were instead made to disappear. Dear Surly, sorry you had trouble. I was there supremely early so there was no queue to get in. I was going to go for a wander through the caravans later, but was advised that I might have to leave my bag outside if I did. Glad you are in the KOMAAN KEVIIIIIN camp. Keep the faith ?? ?